“Pump Up the Jam” leaves me completely speechless Steph! It is fabulous on you too! Thank you! : ) I know you’ll love this one. Pump Up The Jam = AMAZING! Can’t wait to see pics with sunlight. I’ve never used Lippmann polish. In general, how is the formula (application, wear time, etc.)? Chrissy – Lippmanns are solid polishes, they have good wear time and the ones I’ve tried have applied really well. Scrangie – Yea, I mean, I like the colors, but this is stuff we’ve seen before – except for PUtJ which is just gorgeous. Pump up the Jam looks great! A wonderful deep color! 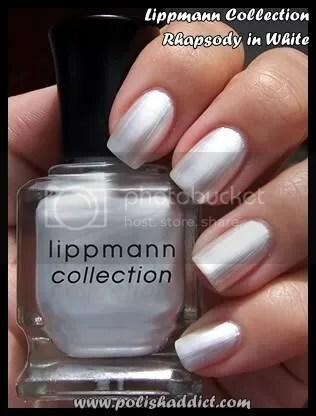 I am drawn to Rhapsody in White. I agree about black. It’s been done people. gymnastgirly beat me to punch. I was wondering how it compared to LPAM as well. oh your nails look awesome! Brush strokes aside, that Raphosdy in White is just a darn classy looking color. It would also go with just about anything, I would think. I like the fact that is is not just pure white, but the silver in it seems to add some ‘body’ to it and makes it a very attractive color. As far as black polishe goes, about the only difference that I can tell is the way it applies and finishes (amount of gloss). Otherwise, a $20 bottle of Channel seems to look like a $3 bottle of OPI (at least my wife gets them for this price at the salon she works at). In fact, black is what I currently have on my toes! Tink – I’ll definitely get to it this weekend, with the sun. : P And I’m going to try to figure out a way to minimize brush strokes, because I really like RiW’s color. Jake – I agree, I’m going to try to work something out to minimize brush strokes. I revisited my Milani and there is definitely a difference in application. Lippmann is superior, but in the end black is black. lol. pump up the jam is GORGEOUS. it’s a little less metallic than LPAM in a good way. the black is my favorite. it’s glossier than any black i’ve ever used and chips a whole lot less as well. black is back for 2009!